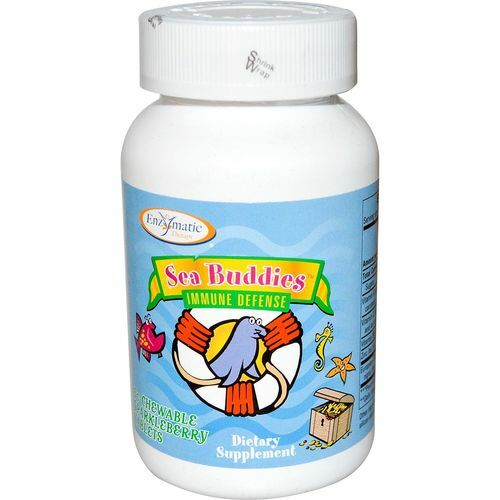 Sea Buddies Immune Defense by Enzymatic Therapy offers a range of elderberry, zinc, Vitamins C, B6 and A in a fun chewable tablet that your little one will enjoy. Warnings: If pregnant, nursing, or taking prescriptions drugs, consult your healthcare practitioner prior to use. Notes: Contains no sugar, salt, yeast, wheat, gluten, corn, soy, dairy products, artificial coloring, artificial flavoring, or preservatives. This product contains natural ingredients; color variations are normal. Recommended Use: Chew one tablet daily. When extra support is desired: Children age two to less than four years: chew two tablets daily. Children age four years and over: chew two to four tablets daily. The customer reviews posted below are based on individual consumer experiences and may NOT necessarily represent what expected results will be from using or taking Enzymatic Therapy Sea Buddies Immune Defense - 60 Chew Tablets. These results may not be typical and you should not necessarily expect to receive the same results. Actual results may vary. Sea buddies Immune Defense provides a great way to get my 8 year old through the cold and flu season. The chewable tablets taste great and don't upset her stomach like some of the liquid forms of elderberry do. This is our third year of taking Sea Buddies - I would highly recommend them. My kids have been taking Sea Buddies Immune Defense for a few months now - I think they are great. Although it took time for them to get used to the taste, they take them everyday with their dinner. It makes me feel good knowing they are getting good immune support and the quality is excellent. I also take them from time to time.